The characters in that world exist in the wild west where the world has gone mad. 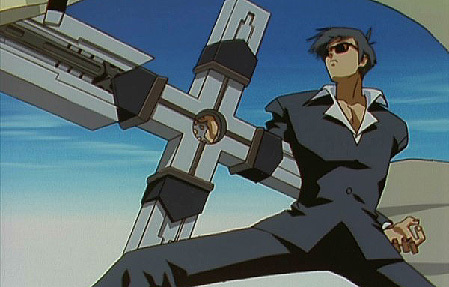 For Wolfwood being a Priest and believing that killing is the only way to make it in the world says a lot. His hand sullied with the blood of his friend and his only other friend is a pacifist who understands him but doesn’t agrees with his ways. Wolfwood was dealt a bad hand being raised by nefarious men, groomed for vile purposes, and has a duty to protect the children of an orphanage so they wouldn’t suffer the same fate as he. How could anyone manage such a burden?Jesus tells us in Matthew 11:28-30 that he will pick up our heavy burdens if we just depend on him and allow him to carry our burdens. We all are dragging our plows through life, drudging through life’s puddles of mud and manure to get to our next phase in life. We have to keep the faith and lean on Jesus to get us through. Waiting for promotion or a job that hasn’t happened yet. Getting through school as you muscle through midterms. Suffering through the back and body pains from pregnancy. Those are burdens we bare and we may get tired but the Lord is saying let me carry your load. Heavenly Father, the stress of this world gets to us so much that it brings us to our knees again and again. I am thankful so thankful that you promise to make my burdens less as long as I keep carrying my cross and follow you. Please grant me rest and peace. In Jesus name. Amen.